I got a few emails from friends wondering where my Friday Flower Fiesta was for this past Friday. Ooops. I was so busy making money to pay June’s bills that I forget to do a Friday Flower Fiesta. I did get out to play a bit, even going to a Park that I never would have gone to alone because it’s in a bad area of town. Real bad area. Yet I’ve always wanted to go there because the murals look so fascinating as you drive up the bridge. Yes, yes, I know I’m being vague. You’ll just have to wait. Patience, my dears, patience. While I’m cataloging the pictures I took and writing a few blog posts about the Park, following is a picture of a cactus flower in the park. The bees were quite active, and when I looked at this picture, I remembered all those parties I hosted in my younger days when guests always arrived at the same time. 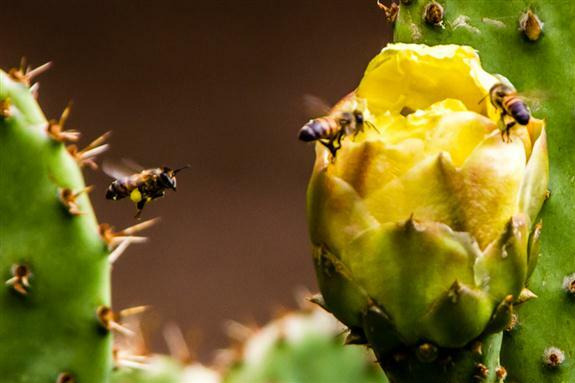 This entry was posted in Fauna, Friday Flower Fiesta, Mother & Father Nature, Photos, Picture of the Moment and tagged cactus flowers, honey bees on June 11, 2012 by Russel Ray Photos. Bees are good! I was interested in the view out my office window today because there was tons of one type of bee hovering all around the plum tree and the spent rhododendon bush. The plums are well beyond blossom and have green fruit about the size of large olives, and I wondered if, since the weather’s been so cold and it was finally very warm today, maybe the bees came out late and were remembering last year’s feeding grounds…too late. I have no idea really, but I can’t remember ever seeing so many bees that were so avidly seeking but not landing or feeding. I hope they’ll survive. In reverse, our very abundantly blooming rhody at home has a very small population of bees at the moment. Last year you could hear the bush buzzing out by the street as soon as you stepped out on the front porch. Hmmmm. 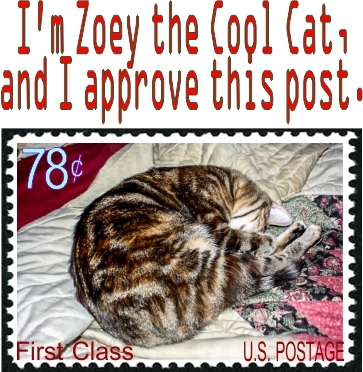 Ah yes, your post….I was commenting on your post…lol. I love the photo, and the title was brilliant today. Really pulled me in, and it is so often true at parties. And then they all stay in the kitchen! Sounds like your bees right now are swarming. Little Miss Queen is probably around somewhere looking for a new place to call home. Cool! I hope they set up camp just on the other side of the fence where my allergic co-worker won’t have to fret too much but I’ll get to see them working when I’m suppose to be…and I’m not. Remember to take pictures. We want pictures! I’ll see what I can do. Bees very small…lens very short…hmmm. Ok, Russel, I added my best bee picture, just for you! http://sherijkennedyriverside.wordpress.com/journal-expressions/something-random/ I’ll still see if I can capture the swarm…in a photo, soon. I can use more bees in my organic garden like these. Great photo! Oh you make me laugh! I try my best to not do that or I’d be yabbering at everyone to ‘grab a drink’ and ‘get over here’… Actually as I write that, it doesn’t sound so bad. I should trust that my friends are more self-sufficent! Put up a sign: Glasses on the counter, Ice in the chiller, Meet me in the back yard!